« Misogynist Finland: How did our colleague know? Shiveluch Volcano in Kamchatka peninsula erupted at 08:00 local time on Friday (23:00 Moscow time, September 25) discharging a column of ash to an altitude of about 4.5km above sea level, Kamchatka office of the Geophysics Service of the Russian Academy of Sciences told Itar-Tass. Shiveluch is one of the most active volcanoes on the Kamchatka peninsula. KVERT had previously reported above background levels seismic activity at Shiveluch during 12-19 September. Seismic data analysis, video camera and visual observations indicated that “a small hot avalanche descended the SE side of the lava dome, producing an ash plume that rose to an altitude of 6.5 km, and drifted 100 km NE”, GVP reported. Karymsky, another of Kamchatka’s volcanoes, also discharged ash to an altitude of about 3km Friday, possibly due to an explosion. This followed KVERT report for enhanced seismic activity at Karymsky during 12-19 September. Klyuchevskaya Sopka [Kliuchevskoi,] Eurasia’s highest volcano (elevation of 4,700 m a.s.l.) was also reported as showing seismic activity that “considerably exceeded” the background level, with a total of 196 local quakes recorded during the previous 24 hours. Despite heightened thermal anomaly, no eruption was reported. This entry was posted on September 26, 2008 at 1:52 pm	and is filed under ash plume, GVP, Intense Global Volcanic Unrest, kvert, lava dome. 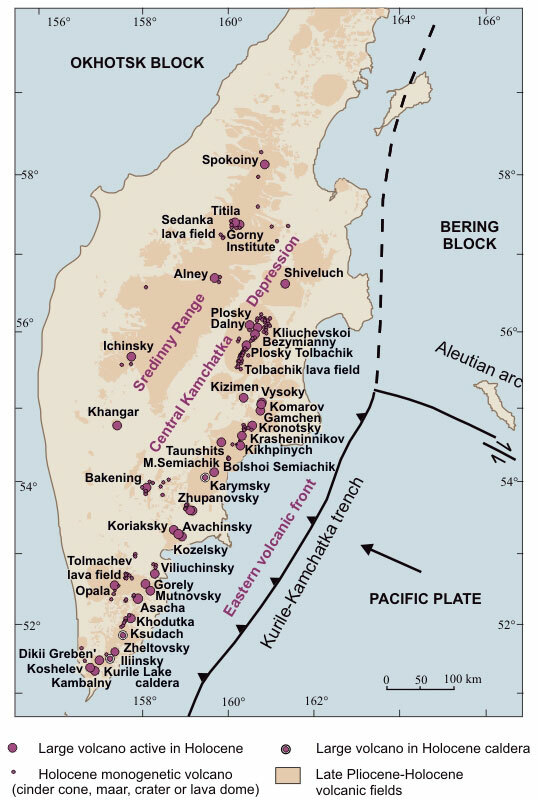 Tagged: Holocene Volcanoes, Kamchatka, Karymsky, Kliuchevskoi, Shiveluch. You can follow any responses to this entry through the RSS 2.0 feed. You can leave a response, or trackback from your own site. Geologists from the University of Leicester are among four scientists- including a Nobel prize-winner – who suggest that the Earth has entered a new age of geological time. And they add that the dawning of this new epoch may include the sixth largest mass extinction in the Earth’s history. Jan Zalasiewicz and Mark Williams from the University of Leicester Department of Geology; Will Steffen, Director of the Australian National University’s Climate Change Institute and Paul Crutzen the Nobel Prize-winning atmospheric chemist of Mainz University provide evidence for the scale of global change in their commentary in the American Chemical Society’s’ bi-weekly journal Environmental Science & Technology. The scientists propose that, in just two centuries, humans have wrought such vast and unprecedented changes to our world that we actually might be ushering in a new geological time interval, and alter the planet for millions of years. Zalasiewicz, Williams, Steffen and Crutzen contend that recent human activity, including stunning population growth, sprawling megacities and increased use of fossil fuels, have changed the planet to such an extent that we are entering what they call the Anthropocene (New Man) Epoch. First proposed by Crutzen more than a decade ago, the term Anthropocene has provoked controversy. However, as more potential consequences of human activity — such as global climate change and sharp increases in plant and animal extinctions — have emerged, Crutzen’s term has gained support. Currently, the worldwide geological community is formally considering whether the Anthropocene should join the Jurassic, Cambrian and other more familiar units on the Geological Time Scale. trying to date lava fragments found in southern Styria, Austria. When was earliest/latest volcanic activity there? Late Phase: Pliocene to Quartenary (characterized by alkaline basaltic lavas in the southeastern Styrian Basin).